Check out these fun volcano facts for kids. Learn about hot magma, famous eruptions, volcanoes on other planets, volcanic gases, flowing lava and more. Enjoy our wide range of strange and interesting facts about volcanoes. Volcanoes are openings in the Earth’s surface. When they are active they can let ash, gas and hot magma escape in sometimes violent and spectacular eruptions. Volcanoes are usually located where tectonic plates meet. This is especially true for the Pacific Ring of Fire, an area around the Pacific Ocean where over 75% of the volcanoes on Earth are found. While most volcanoes form near tectonic boundaries, they can also form in areas that contain abnormally hot rock inside the Earth. Known as mantle plumes, these hotspots are found at a number of locations around the globe with the most notable being in Hawaii. Hot liquid rock under the Earth’s surface is known as magma, it is called lava after it comes out of a volcano. 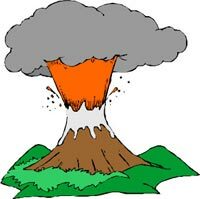 Some famous volcanic eruptions of modern times include Mount Krakatoa in 1883, Novarupta in 1912, Mount St Helens in 1980 and Mt Pinatubo in 1991. While we certainly have some big volcanoes here on Earth, the biggest known volcano in our solar system is actually on Mars. Its name is Olympus Mons and it measures a whooping 600km (373 miles) wide and 21km (13 miles) high. The object with the most volcanic activity in our solar system is Io, one of Jupiter’s moons. Covered in volcanoes, its surface is constantly changing to the large amount of volcanic activity. Most people think of volcanoes as large cone shaped mountains but that is just one type, others feature wide plateaus, fissure vents (cracks were lava emerges) and bulging dome shapes. There are also volcanoes found on the ocean floor and even under icecaps, such as those found in Iceland. Volcanoes can be active (regular activity), dormant (recent historical activity but now quiet) or extinct (no activity in historical times and unlikely to erupt again). While these terms are useful, scientists are more likely to describe volcanoes by characteristics such a how they formed, how they erupt and what their shape is. Common volcanic gases include water vapor, carbon dioxide, sulfur dioxide, hydrogen chloride, hydrogen fluoride and hydrogen sulfide. Volcanic eruptions can send ash high into the air, over 30km (17 miles) above the Earth’s surface. Large volcanic eruptions can reflect radiation from the Sun and drop average temperatures on Earth by around half a degree. There have been several examples of this over the last century. Pumice is a unique volcanic rock (igneous) that can float in water. It can also be used as an abrasive and is sometimes used in beauty salons for removing dry skin.